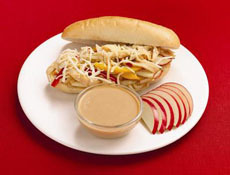 Add creamy peanut butter and apples to a chicken cheesesteak to get a Po’ Boy Peanut Butter Chicken Cheesesteak. CAPSULE REPORT: This is the sixth of six award-winning, delicious and nutritious recipes developed by children in Jif’s annual “Most Creative Peanut Butter Sandwich” college scholarship contest. Click on the black links below to see the other recipes. For more peanut butter recipes and product reviews, visit our Gourmet Peanut Butter Section. Regional culinary influences was the inspiration behind the Po’ Boy Peanut Butter Chicken Cheesesteak, which won the 2009 “Most Creative Peanut Butter Sandwich” seventh-annual contest. Created by ten-year-old Jordyn Boyer of Lebanon, Pa., the sandwich provides a twist on her home state’s cheesesteak staple by adding creamy peanut butter and apples to the more traditional ingredients: chicken, peppers, onions and mozzarella cheese. For added flavor, she also created a peanut butter dipping sauce heavy on the honey flavor that can also be used as a dip for a side of sliced apples. Cut peppers into strips, cut onions into rings and slice apples into strips. Put into sauce pan with olive oil and cook on medium heat until soft. For the sauce, heat a sauce pan on medium heat and add creamy peanut butter, Worcestershire sauce, honey mustard, honey and water. Cook until creamy and soft. Add three tablespoons of peanut butter sauce to the chicken/pepper/onion/apple mix. Stir together. Put the chicken mixture on the hoagie/sub roll and sprinkle with mozzarella cheese. Cut the remaining half of the apple and place it on a plate with left over peanut butter sauce for dipping.